PIE – Plastics Information Europe strengthens your position in business negotiations with customers and suppliers. Our polymer price indices are accepted as neutral market reports throughout the industry and embedded in countless supplier contracts. With PIE’s well-founded market analyses and forecasts you are always well prepared for your price negotiations, and enjoy transparency and calculability in your daily business. As one of the most successful information partners for the European plastics industry we have been supplying reliable business news for more than 40 years! 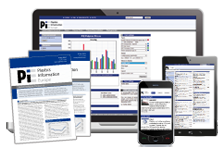 PIE provides you with up-to-date and reliable information about the plastics industry: from polymer prices to market reports, company news and product launches. More than 5,000 European companies *) put their trust in our data and reports – there are few other providers trusted by as many companies in Europe! Benefit from the professional expertise of our highly qualified and experienced editorial team, which prioritises the news and provides you with independent and objective market information. PIE researches and reports the market price of all important polymers, drawing on one of the largest networks in the industry. Prices are based on information gathered from converters, distributors, traders and producers, assuring a high degree of quality and reliability. For more information on our polymer price research click here. Print: PIE print on your desk or on the go: PIE’s biweekly newsletter provides concise news and insights for busy plastics company executives. For thousands of plastics industry decision-makers, the newsletter is a must-read. Mobile: PIE mobile is the perfect choice when you are on the road. At mobile.pieweb.com you can access the most important sections of PIEWeb – optimised for smart phone usage. More than 40 years of experience coupled with a unique network of industry contacts testify to the fact that PIE is a professional partner for your business tasks. ...it is Europe’s best source for overall and detailed information about the plastics industry! ...it‘s the best and fastest way to manage important data for my business.